I rarely find home education materials in big-box bookstores, so you can imagine my surprise when this book jumped off the shelf and into my hands. 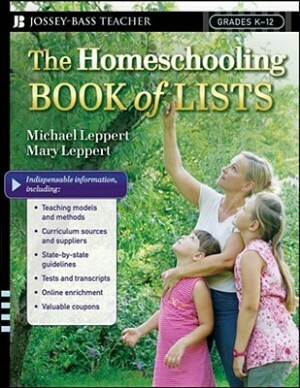 Michael and Mary Leppert’s comprehensive The Homeschooling Book of Lists is a resource I consult quite regularly. And here’s why: it’s jam packed with information. Of course, any print materials that list website URLs run the risk that those addresses won’t always be valid. The same holds true for this manual. However, a simple Google search enabled me to find whatever I needed, so this really isn’t an issue. I’m always on the lookout for new and different resources to enrich my children’s education, but I don’t have a lot of time to devote to this particular activity. The Homeschooling Book of Lists makes it easy for me. In fact, my own copy of this handy reference tool for busy homeschooling families boasts highlighted and dog-eared pages — and for good reason! A homeschooling mother, Ellen lives in the Deep South with a transplanted Yankee husband, two middle grade daughters, and two adorable corgis, Jasper and Georgette. She espouses a literary-based education with a Charlotte Mason emphasis. She squeezes in time to write between teaching, managing the household, ferrying the girls to their activities, and volunteering with said activities. Iced coffee and prayer keep her going. You can read about her life at http://bluestockingbelle.blogspot.com. It looks great! Thanks for sharing.